Every 1 out of 20 internet users today seems to have a blog, but not all of them are equally popular. Some blogs have thousand of readers, while some strive to get even a dozen regular readers. Some blogs have hundreds of comments on every single post, while some don’t even have a single comment on most of their posts. So what is the secret behind this disparity in engagement on blogs? How does one increase reader engagement with their blog content? Engagement is when a reader “interacts” with your blog content in any way – by leaving a comment, by giving a +1 or a Facebook like, by sharing your post, by signing up for your mailing list, or even just by sticking around long enough to read your entire post! Here are some ways of increasing different types of reader engagement on your blog. A regularly updated blog gets more hits than a dormant blog. Posts on trendy topics attract more readers. Easily readable and understandable content gets read and shared more. Search Engine Optimized blogs get more search traffic. An aesthetically pleasing and uncluttered blog design invites the reader to explore more, thus, increasing pageviews. Providing links to other relevant content on your blog, displaying the tags and categories, and having a prominent “related posts” section at the end of your posts, all make it easy for the visitor to explore. Average time spent by your visitors on your blog. Your blog post might be taking too long to load. Reducing page-load time is vital. Your post title might be misleading, so the visitor didn’t find what he was expecting. Giving relevant post titles will ensure that your content is delivered to the intended audience. Make your comment form visible. Post content on which people might want to say something. Encourage readers to participate in the discussions by asking questions at the end of your post. Leave meaningful comments on other people’s blogs, which will encourage them to do the same for you. Respond promptly to the comments/queries that you receive. Create content that people might want to share. Put clear, prominent sharing buttons on all your posts. Include buttons for all the popular social media sites relevant to your content, i.e. Facebook, Twitter, Google+, Pinterest (if you post images), and Linkedin (if it is business/marketing content). There are third party plugins/widgets available for this, such as AddThis and Shareaholic, that can be easily setup for your blog. Ask readers to share your content if they liked it. Create content that other bloggers in your niche would like to link up to in their posts. Create or participate in blog link-ups. Write guest posts on other blogs in your niche. Signing up for your mailing list. Put a sign-up box at the end of your posts. If a reader has found your post useful or entertaining, chances are that he will subscribe. Offer an incentive for signing-up, like a free e-book. The online world is an interactive world today. Yet, it takes considerable effort to make your blog popular and engaging. It requires discipline, consistency and some amount of quality “out-of-the-box-thinking”, to build a loyal community around your blog. Nevertheless, it is very much doable. What practices do you follow to encourage reader engagement on your blog? Which topics are liked most by your readers? Can you give examples of some blogs that have managed to build such a community? Can you suggest some active blog link-ups? This is my fifth post for 2015 AprilAtoZ. 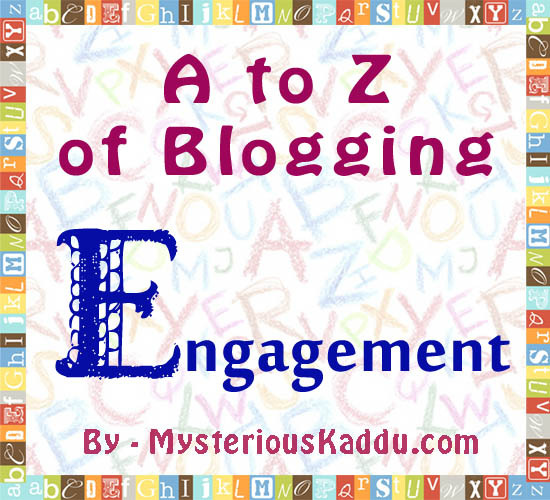 Link to the previous post: A to Z of Blogging: D - Design. What a great post...btw how do u reduce page load time..is there a way? Interesting post -- lots for bloggers to think about! Uncluttered design, fast loading = check! wonderful pointers. Blogs that take a lot of time to load and have bad font don't leave a good impression on me. This is such an informative post. Loving the theme you picked. Off to check the earlier posts that I must have missed in this theme. So glad to have connected with you through AtoZ. Will be dropping by regularly. Excellent tips for blogging engagement! I wrote a guest post on the same subject, concentrating on comments and sharing. The Blogosphere is a social place and thrives on interaction. I’m popping in via the A to Z Challenge, as one of the assistants. I've never heard of AddThis or Shareaholic. They sound quite useful. However, I'm quite reluctant to have too many social media buttons on my blog. As it is, I'm just about managing with Twitter, Google+ and Facebook. This is because of my "partially-challenged technological brain." But I'm learning. A step at a time. Me too, Vinay! Not too much into engagement and networking. Thanks Debbie. Yes, interaction is important. Thank you, Michelle. I have used AddThis on my blog, and I see a lot of A to Z participants using Shareaholic on their posts. A step at a time is good. I'm using the same strategy for networking. @Saxierthanthou: Thank you. Glad you find these posts useful. I couldn't find your blog listed in your blogger profile. Would appreciate if you'd post its URL here so that I can also visit it.